Perfect for your next blokes trip or even family holiday! Day 1 – The boat departs the Exmouth Marina between 7-8am to arrive at the magical Montebello islands at about 6pm. 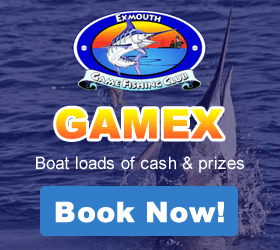 To pass the time, we throw the lures out and trawl for Sailfish, Marlin, Mackerel and Tuna. Stopping off at the Barrow Island we catch some bottom fish to throw on the Barbie for your first night. Day 2 – After a cooked breakfast, we spend the day trawling, snorkelling for crayfish and sightseeing around the islands. Day 3 – Bottom fishing and trawling around the islands. Day 5 – Fish our way down to Long Island, bottom fishing and trawling before we spend the last night moored at Long Island. 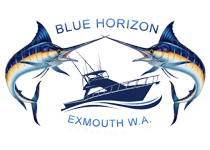 Day 6 – Bottom fish and trawl till 12pm, then steam into Exmouth arriving around 3pm. Enjoy a Montebello Islands fishing adventure, pristine water enjoy the fishing, cray fishing, diving, surfing and spear fishing. 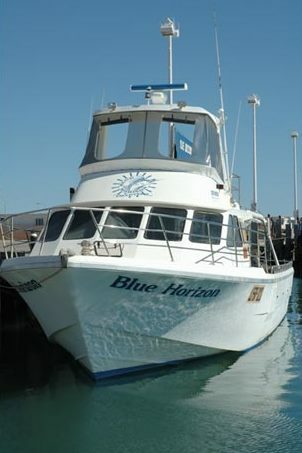 The Blue Horizon, a luxury vessel equipped with the latest electronic equipment, 240 V power and air-conditioned. Breakfasts – Ham cheese tomato croissants, Bacon, eggs ,sausages, toast, beans and a selection of breakfast cereals and juices. Morning Teas – biscuits, cake, tea, coffee. Dinners – Steak night, Thai fish curry and a seafood feast. Fishing Gear – We have Fin Nor offshore reels spooled with 80lb braid. All bottom bouncing gear is provided plus some lures for trolling for Spanish mackerel and trout. If you would like to bring some jigs and soft plastics you are more than welcome to bring them along as well as you own rods and reel if you like. Sleeping Arrangements – We have 9 bunks on the Blue Horizon all air-conditioned or you can grab one of our stretcher beds and roll the swag under the stars. Snorkelling Gear – We have snorkelling gear on board. However if you want to go spear fishing you will need to provide your own spear gun. Please note all trips can be tailored to suit your needs. The development of the pearling industry along the North West coast in the late 19th Century formed the next exciting chapter in the history of the Montebello’s. The pearlers who fished the waters and camped on the islands are probably responsible for the introduction of the cat and the black rat who in turn are accountable for the extinction of the golden bandicoot and spectacled hare wallaby. One of the most notable characters among the pearlers was Thomas Haynes, who held a pearling licence for the Montebello’s from 1902-1913. Evidence of his pioneering experiments in raising pearl oysters can still be found on Hermite Island. There is an inscription in cement “The Montebello Experimental Shell Pool, Constructed 1906. Completed 20 September 1981 by R.P. Morgan and Crew”. Haynes also left other evidence of his presence, which the W.A. Museum picked up on a recent survey. These include bottles of tonic (apparently a necessity because of the poor diet imposed by the remoteness) and a bottle bearing the proud legend Swan Brewing Co. Some things don’t change much with time!! Haynes left Hermite in 1909, after a willie willie’ completely destroyed his house and damaged his oyster enclosure.